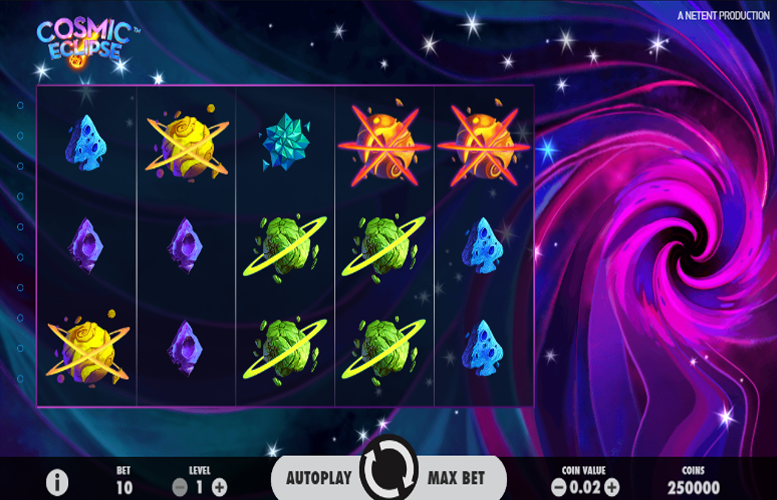 Take a trip into deep space on the Cosmic Eclipse slot machine from Netent. The visual team have done a particularly good job at creating a stylish modern slot machine with lots of character. With its psychedelic space-scape and ethereal music, the game has an atmosphere all its own. In terms of specifics, the game is played over 10 lines and a standard five by three board. There is only one special feature but fortunately, it is a great one. We’ve never encountered such a feature before and its that kind of innovation that creates the best games around. Vibrant colours and beautiful stylised artwork. Netents visual department have done a wonderful job with Cosmic Eclipse. Highly innovative bonus mode. 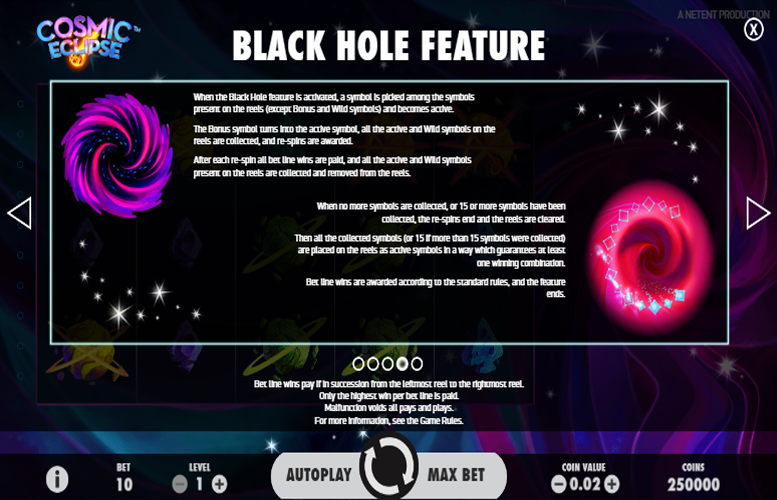 We’ve never seen a gameplay feature quite like the Black Hole Feature before. Lacks additional bonuses. Whilst the Black Hole Feature is certainly great, it’s the only one the slot has to offer. This is a missed opportunity by Netent. Red Planet = 600x the line bet. Yellow Planet = 350x the line bet. Green Planet = 150x the line bet. The game’s “Bonus” symbol can appear on reel five during the main game only. It activates the Black Hole Feature. 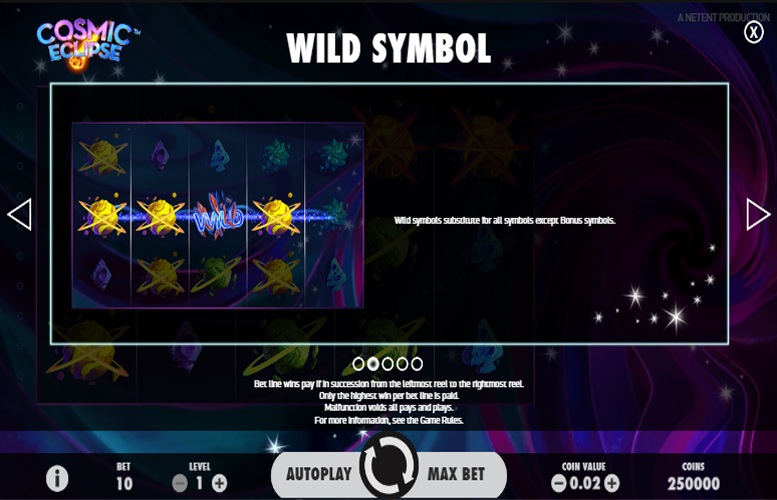 When the Black Hole Feature is activated, a symbol is picked from amongst those symbols present on the reels (except “Bonus” and “Wild” symbols). It subsequently becomes active. The “Bonus” symbol turns into the active symbol, and all the active and “wild” symbols on the reels are collected. Following this, re-spins are awarded. When no more symbols are collected, or 15 or more symbols have been collected, the re-spins end and the reels are cleared. Then, all the collected symbols (or 15 if more symbols have been gathered) are placed on the reels as active symbols in a way which generates at least one winning combination. Bet line wins are then awarded according to the standard pay outs and the feature ends. Green Debris = 50x the line bet. Blue Debris = 40x the line bet. Purple Debris = 30x the line bet. 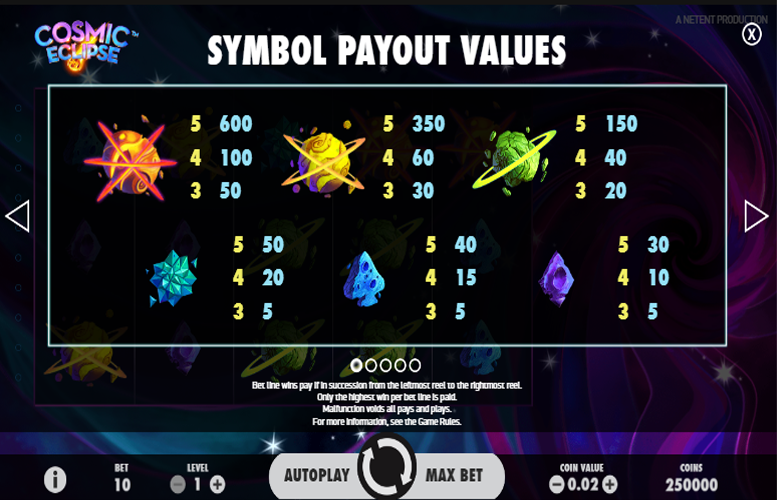 Since the number of win lines are fixed at 10 on Cosmic Eclipse, the player is only able to adjust the number of coins bet on each of them, along with the value of each of them. Here, the minimum value is 1p and the maximum is £1. 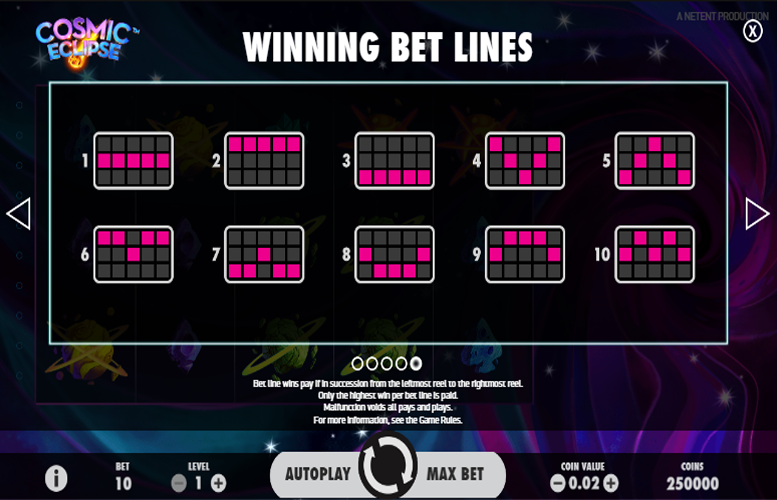 Meanwhile, there is the option to vary the number of coins bet on each line between one and 10. This makes the maximum and minimum bets per spin £100 and 10p respectively. All told, the Cosmic Eclipse slot machine is a decent game for a few spins every now and again. However, lacking a true second screen bonus, “pick me” stage, or free games, players will likely get bored quickly. This will also almost certainly limit the replay value of the slot too. That said, we can image the kinds of players who are more interested in visual presentation than they are multiple features and side games will adore the title. For these players, Cosmic Eclipse is a real treat. The highly stylised background, and the popping, vibrant planets make for a strong look indeed. This game has a rating of 4 / 5 with 372 total reviews by the users.